PS. 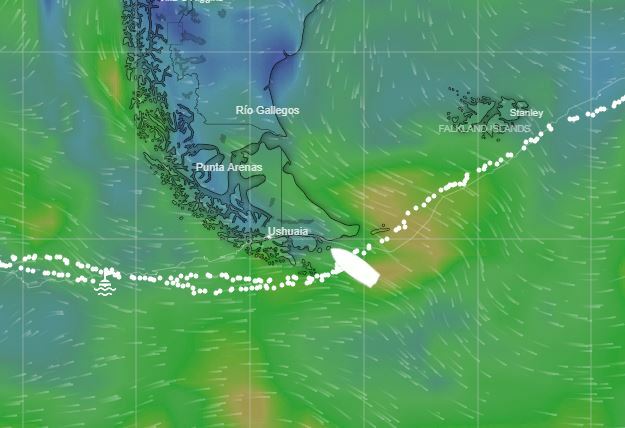 Two roundings of Cape Horn in one voyage. Has that been done before? I don’t know. The forecast had been wrong for days now, so much so I was beginning to worry it and I were out of sync. For three days, it told of a Force 7 southerly that never developed. 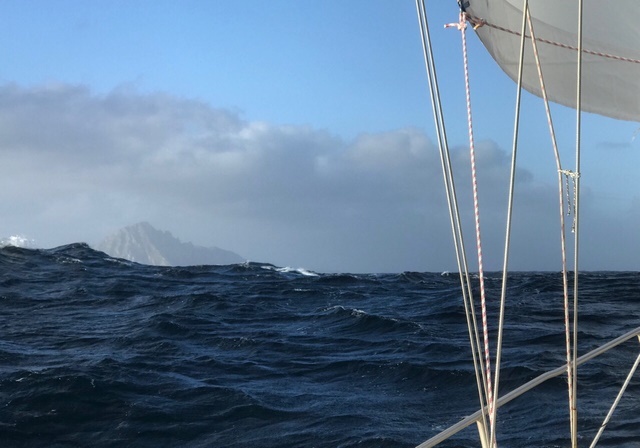 Each day our position crossed a great stream of red feathers on the weather map, but our wind, the wind we were sailing, remained fickle and mostly light. That day’s forecast, retrieved just that hour, showed the low moving off to the north and Mo in clean air veering slowly from south to west overnight. Given the previous days, I should have expected this result. Clearly we’d not escaped the low’s inside edge after all. I dashed into foulies and harness, and all the while, wind remained high. On deck, Mo was stilI heeled way over and had rounded partially, rail sloshing with water, sails flogging. I gave a tug to Monte’s control line and quickly rolled two reefs in the working jib. Then I moved to the main. I thought to throw in a third reef, but thought again–a wind of 30 forward of the beam is a tough ask, and who knew where this one was going. I decided to douse the sail altogether. I unwrapped the halyard and began to lower away. Half way down, there was an odd jam. I climbed to the first rung of steps, but it was only a batten caught in the lazy jacks. Another ten feet, and a batten jammed in the cover; again, a short climb and easily freed. Because of the press of wind, each panel had to be hauled out of the sky by hand. It was slow work but finally done. At this point I realized I couldn’t feel my fingers. To my surprise, they were deathly white in the light of my headlamp. 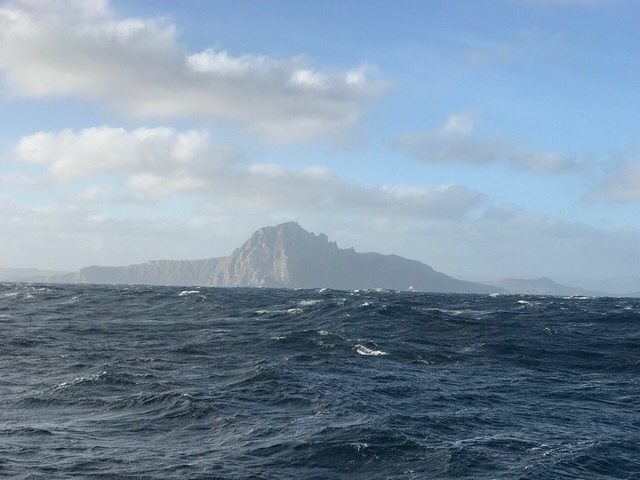 Rain had continued with the wind increase and was bitterly cold, colder than we’ve experienced on the voyage so far. But I hadn’t thought it could act so quickly. The main was all ahoo, but down, and Mo was under control, so I decided to go below and warm up. It took ten minutes to get feeling back. Cleaning up the main and lashing her to the boom for heavy weather required three more dashes below to warm up. It was just that cold. As a rule, I don’t wear gloves on deck. Only fingerless gloves give one the dexterity needed to do work, and I have two good pair, but I don’t like the loss of grip and feeling in my palms. The rails and other hand holds on Mo are slippery enough as it is; I want to be sure I feel what I’ve grabbed. But if this level of cold continues, I’ll need to rethink that strategy. By 2AM wind had dropped to twenty; by 4am, ten. But the day had worked me. 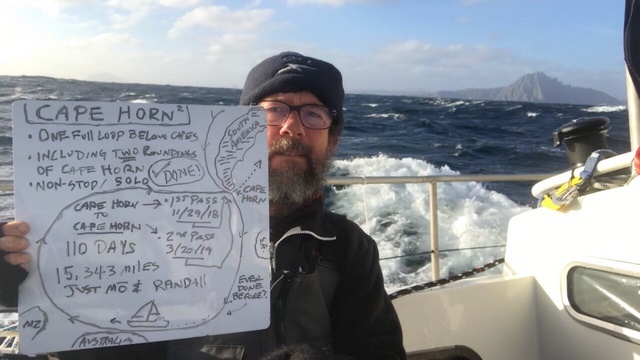 I stayed in my bunk and did not move to make more sail until first light at 5AM. And that is a long-winded explanation for our day’s poor mileage. This morning, I found a small tear in the second panel of the working jib, only about an inch long, vertical. Winds were light enough early that I could drop the sail and apply some sail tape. Now another low is on us, but this one comes with blessedly west winds. And with it we fly toward the Cape. The next three photos show the progression of the front’s arrival. This took about three hours.